by Danielle Ricks.In Facebook, Google, Social Media for Social Good, Social Networking, Twitter. 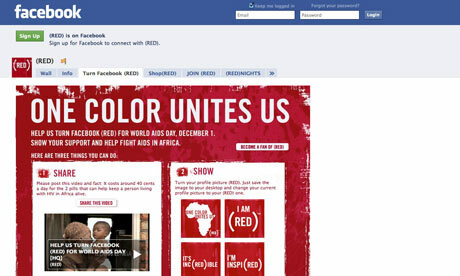 Facebook, Twitter and Google are coming together for a good cause and painting the internet red for World Aids Day. Already I’m seeing my tweets and those of my fellow tweeple showing up in red. You can show your support on Facebook by changing your profile photo to a red icon or avatar. I’m not sure I’ll be changing my profile photo but I am all red on Twitter. I like U.S. Google’s idea of adding a red ribbon to their homepage but I wish they had a more interactive component for us to use in our profiles. In any event, it’s amazing what the power of social media can do when they get together for social good! Here’s more on the story. 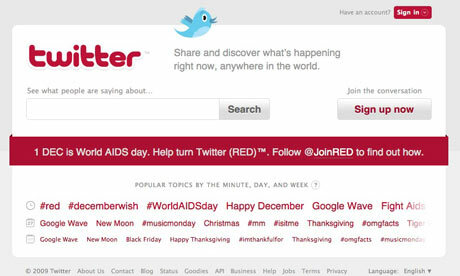 To awareness, the sign-in screen of the Twitter homepage has been changed to red, and the tweets can change their colour. If the hashtags #red or #laceupsavelives are included in tweets they will turn the font red from its usual black. The US version of Google.com has a red Aids ribbon on its homepage and provides a link to various charities connected with fighting the disease. And Facebook has also encouraged members to join red and change their profile pictures to a red logo, and to share a video about the low cost of the treatments it takes to keep patients with HIV alive. During 2008 some 2.7 million people became newly infected with the virus and an estimated 2 million people died from Aids. According to figures of UNAIDS, estimated 33.4 million people live today worldwide with the HIV virus. The World Aids Day is dedicated to raise awareness of the spread of HIV infection. It is a day when people who died of the disease are commemorated. Since 1995 the President of the United States makes an official proclamation.